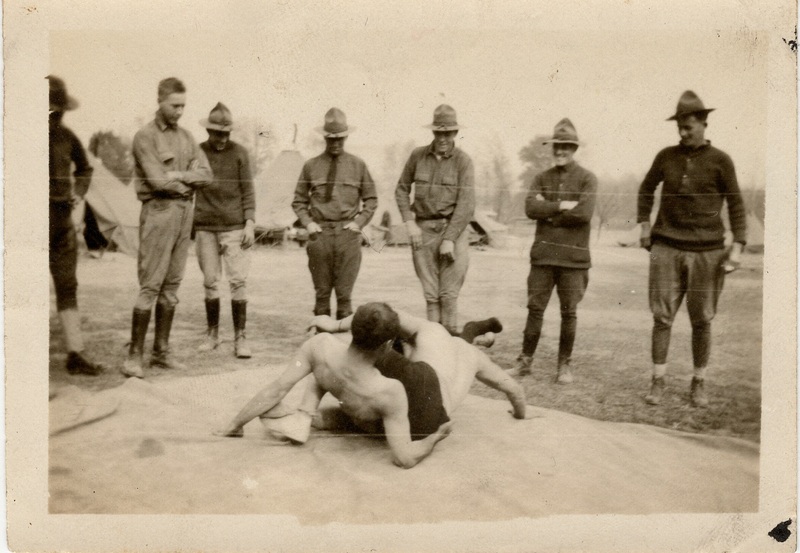 WWI Combatives and Wrestling — Starring my Grandpa | Robert Mitchell Jr. 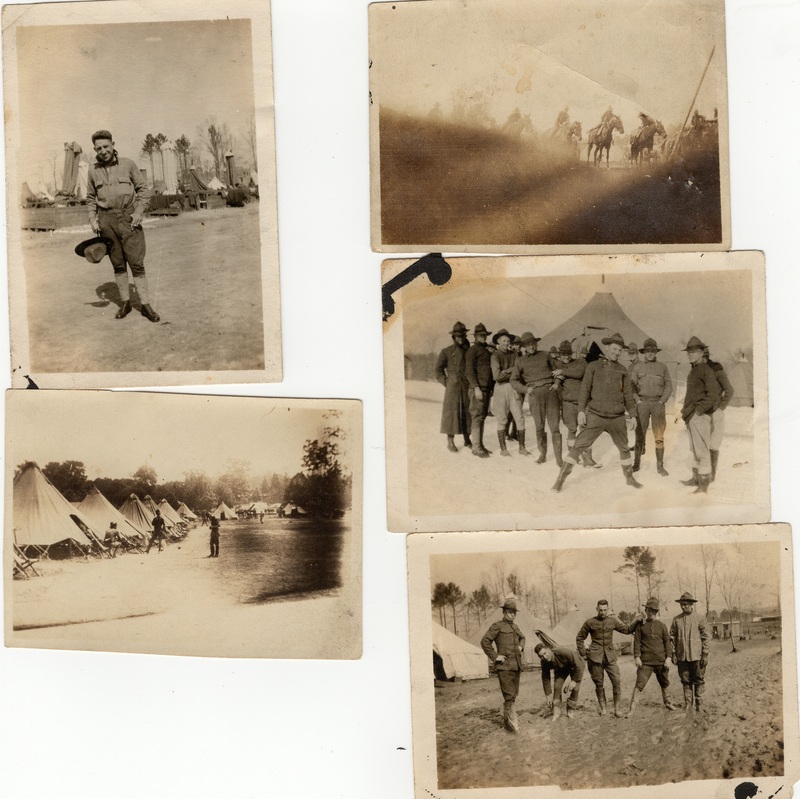 Yesterday, while helping my mother go through some old pictures, I found some amazing shots of my grandfather’s training during World War I. The thing I noticed right away was that they solved the outdoor wrestling problem — too much dirt and not enough mats — the same we do at my martial arts club. But I digress. More on that later. 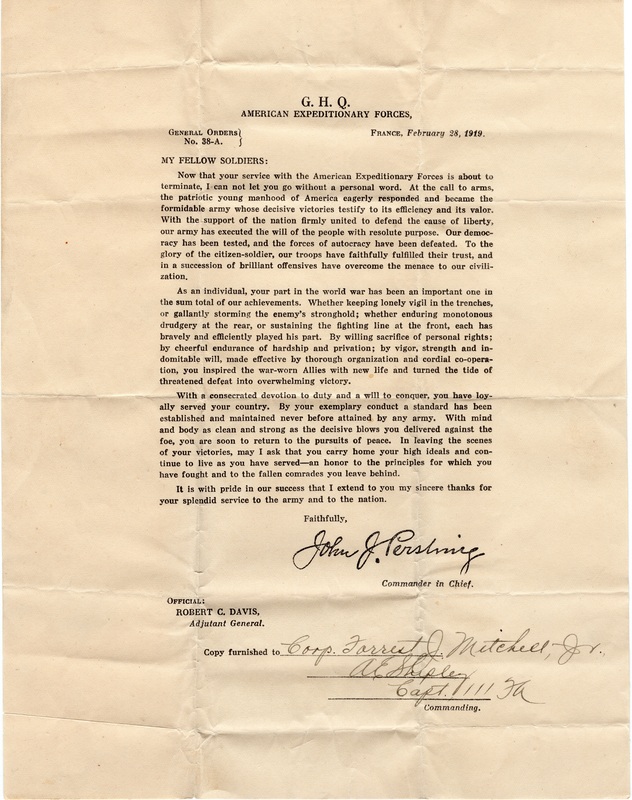 My grandfather was Forrest J. Mitchell Jr. 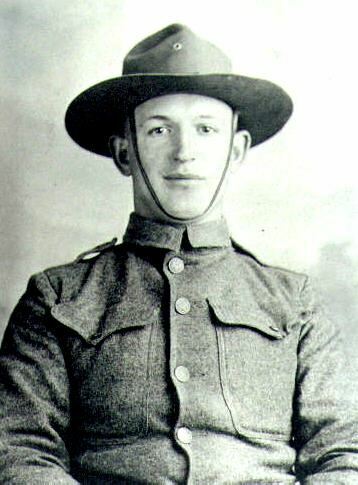 He served in the Army during World War I, joining the day after the war started on April 7, 1917. He was with Battery A, 111th Field Artillery, 29th Division and stationed at Camp McClellan, Anniston Alabama, and Lookout Mountain, Tennessee. See Grandpa there on the far left? Somebody circled his face and drew an arrow. I have no idea at which of the two training grounds these photos were taken. 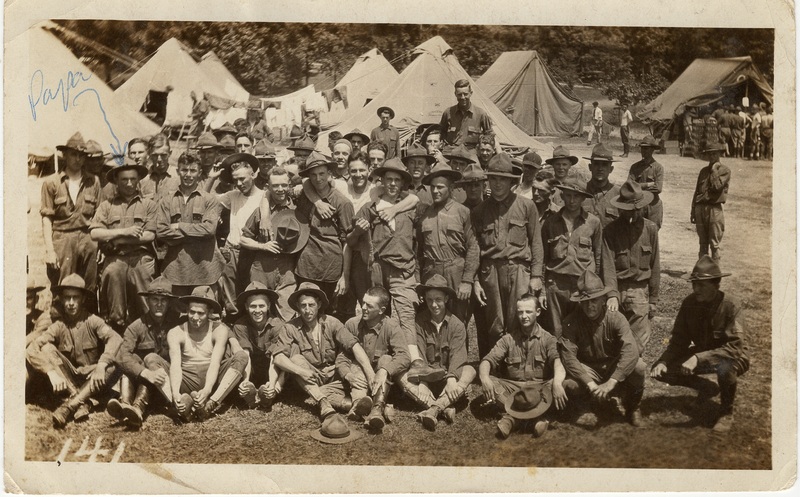 He was shipped overseas from Camp Upton, Long Island, New York, serving his time in France. Classic scramble for position. Looks like the man in the dark pants might be about to go for a leg attack of some sort. As you can see by the three wrestling shots on the right, they just spread out a tarp on the ground and got to work, which is the same way we do at my club — the Order of Seven Hills. It worked ninety-seven years ago and still works today. Mats? Who needs mats? 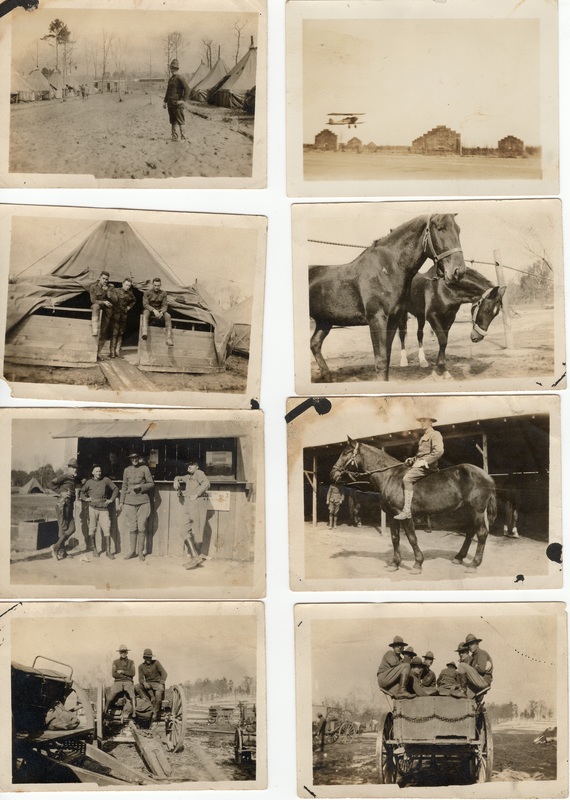 Looking at these photos gives me a feeling of connection to a man I never new. Although he died eight years before I was born, here is another thing we could talk about if we could sit down together. That and the art of wordsmithing of course, since he was the owner and editor of a newspaper in Clarksville, VA and I’m a writer. It’s fun to see we have some things in common and have had some shared experiences, even if they’re small. I like to think he’d be proud of me if he got to know me. 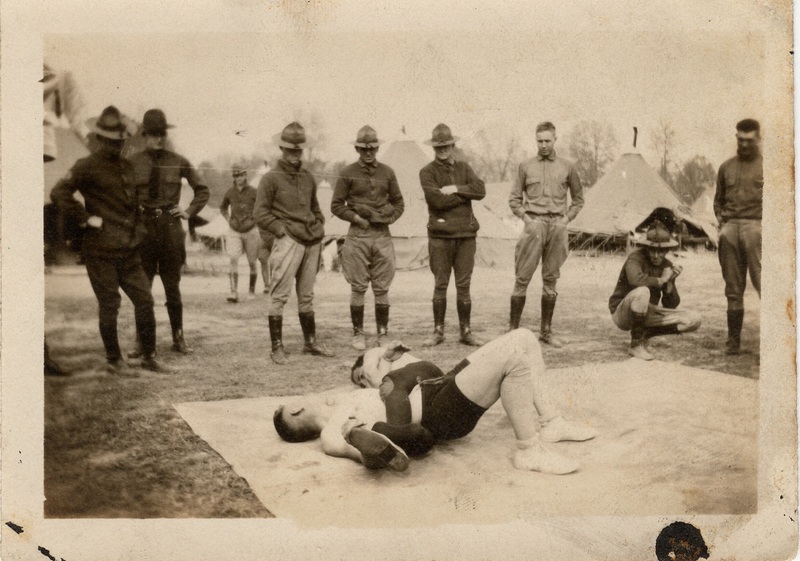 Just to give you an idea of just what combat training was like in 1917, take a gander at the montages below. World War I was so steampunk. 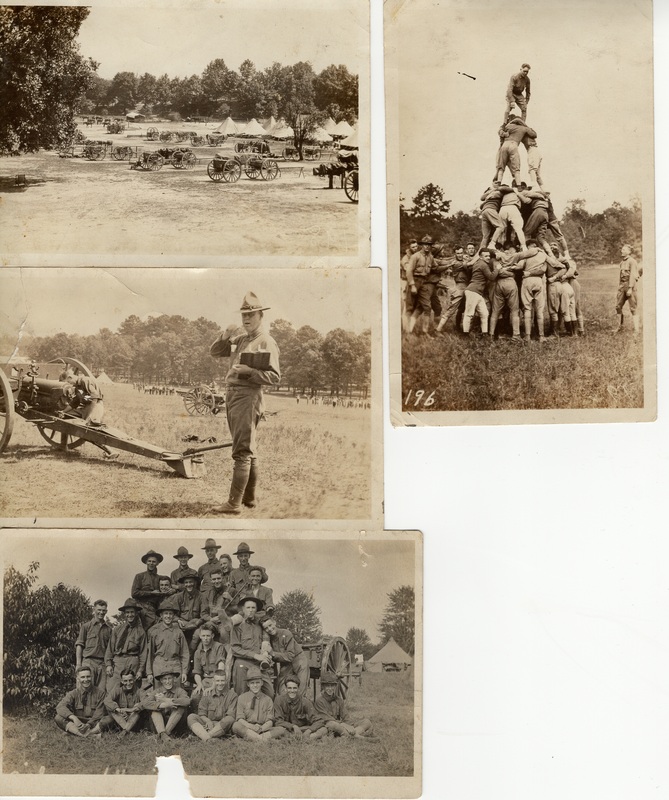 On the one hand you have men wrestling, riding around on horseback and in wagons, and wearing their Smokey the Bear hats. On the other hand, you know that they had poison gas, machine guns, primitive submarines, those freaky rhomboid-looking tanks, and bi-planes (there’s one in the second montage). You just can’t make this stuff up. Check out the human pyramid on the upper right! little bit and from far away. Horses? Bi-planes? Wagons? Less than a hundred years ago and now we’re using drones. 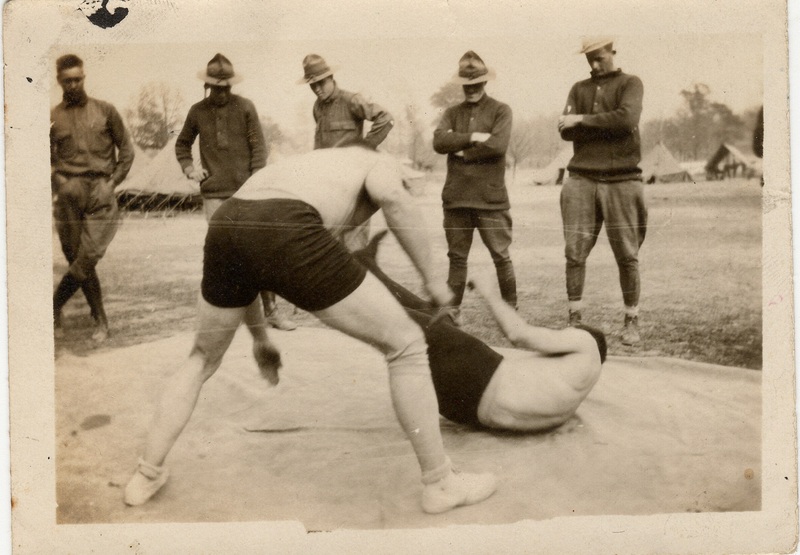 This entry was posted in Martial arts, Mysticism, Writing and tagged steampunk, tarps, wrestling, WWI. Bookmark the permalink. Hello, I found this honestly fascinating and made a little article about your grandfather myself, I couldn’t explain it as well as you could but this touched my heart. http://aminoapps.com/p/hiou8u That’s the article link. Thanks James! I noticed that some of the folks commenting on your posts had some strong thoughts about what is or is not “real” wrestling. I used to be one of those people. I used to look down on professional wrestling as “fake.” That was before I studied Shootfighting/Shooto — a brutal, hybrid martial art with branches and styles created by guys like Satoru Sayama (the original Tiger Mask) and Bart Vale. The line between real and fake is a little blurry. Those who are unsure about this stuff should watch some Shooto videos. Thanks for stopping by and sharing! Pingback: Bagged: Weekly Training Involution #110 | Robert Mitchell Jr.